It is the early 21st Century and Humanity has been plunged into its first ever interstellar war against the implacable Taurans. William Mandella is one of an elite group of men and women being trained as front line soldiers; the preparation itself just as brutal as anyone can imagine the forthcoming battles might be. 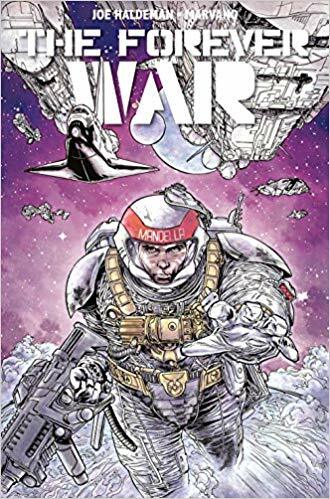 Joe Haldeman’s Vietnam parable The Forever War is a classic of SF, winning both the Nebula and Hugo awards. 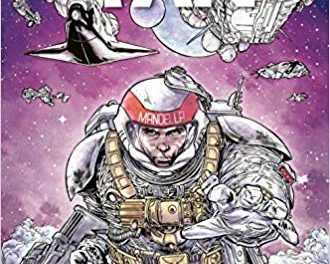 Adapting such a well-regarded novel for comic book is a daunting task, but this version — originally published in 1988 — manages it magnificently. Despite the necessity for abridgement that one might consider unavoidable when rewriting a novel for a more visual medium, anyone familiar with the original source material will be surprised and pleased at just how many of the essential plot and story points have been retained. All of the scenes that stuck in the reader’s mind after first finishing the novel are here and often depicted almost exactly as they appeared in the mind’s eye. 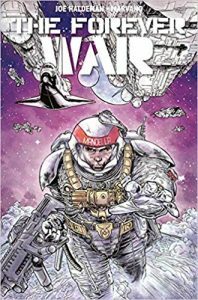 The artwork itself is classy and dynamic, depicting both space battles and hand to hand combat in a realistic and visceral manner, pulling the reader on at a cracking pace very suitable for the pace of the plot. 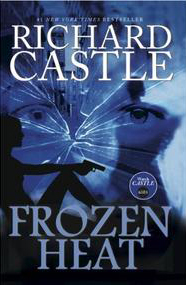 A few minor story elements have been updated — such as pushing the story very slightly further into the future — but otherwise this is a very faithful adaptation, and one that both fans of the original as well as people new to the tale will enjoy.